Blaze Powers up Fire-type moves in a pinch. "When this Pokemon's HP is 1/3 its max or lower, its Fire moves do 50% more damage." Solar Power* "Boosts Sp. Atk, but lowers HP in sunshine. "This Pokemon's max HP lowers and Special Attack rises one level during Sunny Day. is said to spout from the tip of its tail. it burns. You can only hear it in quiet places. life force. If it is weak, the flame also burns weakly. force. If it is healthy, the flame burns brightly. will burn vigor� ously, even if it gets a bit wet. enjoying itself. If the POK�MON becomes enraged, the flame burns fiercely. Emerald The flame that burns at the tip of its tail is an indication of its emotions. 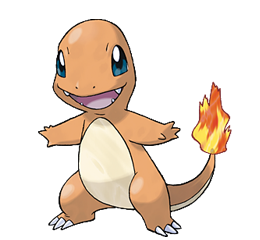 The flame wavers when CHARMANDER is happy, and blazes when it is enraged. FireRed From the time it is born, a flame burns at the tip of its tail. Its life would end if the flame were to go out. Leaf Green It has a preference for hot things. When it rains, steam is said to spout from the tip of its tail. Diamond/Pearl The fire on the tip of its tail is a measure of its life. If healthy, its tail burns intensely. Platinum The fire on the tip of its tail is a measure of its life. If healthy, its tail burns intensely. Heart Gold The flame on its tail shows the strength of its life force. If it is weak, the flame also burns weakly. Soul Silver The flame on its tail indicates CHARMANDER�s life force. If it is healthy, the flame burns brightly. Black The fire on the tip of its tail is a measure of its life. If healthy, its tail burns intensely. White The fire on the tip of its tail is a measure of its life. If healthy, its tail burns intensely.